Arya reaches out to touch the huge teeth. Her reaction here is rather different from the novel, but then the scene is rather less scary. In the book, the room is extremely dark, and it’s filled with a number of skulls. 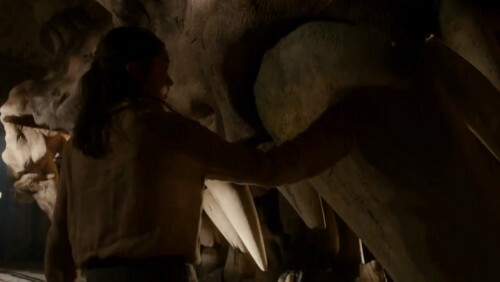 Dragon bones are black in the novels, but for the show they seem to have gone with a more natural bone hue. The texture of it is quite incredible, especially you consider what it looked like as a work-in-progress.